SLAS will host SLAS2018, the seventh Annual International SLAS International Conference and Exhibition, in San Diego, California, from Feb. 3-7, 2018. Through a unique combination of education, access to innovative technologies and intelligent peer networking, SLAS2018 delivers unmatched value for professionals and students looking to discover the latest life sciences technologies and how they can be applied to drive research objectives. SLAS 2018 invites research scientists, engineers, academics and business leaders to submit abstracts for presentation. We are delighted to introduce our latest Lab on a Chip Emerging Investigator, Ashleigh Theberge! 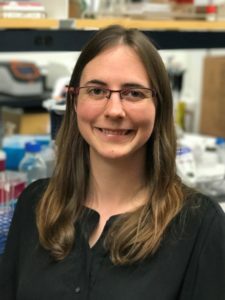 Ashleigh Theberge is an Assistant Professor of Chemistry at the University of Washington and Adjunct Assistant Professor of Urology at the University of Washington School of Medicine. She received her BA in Chemistry at Williams College and her PhD in Chemistry at the University of Cambridge, UK with Wilhelm Huck. 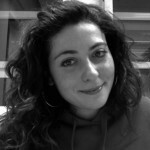 During her graduate work, she was a Visiting Scientist with Andrew Griffiths at the Université de Strasbourg, France. Her graduate research focused on droplet-based microfluidics for chemical synthesis and analysis. She completed her postdoctoral fellowship in Biomedical Engineering and Urology with David Beebe, William Ricke, and Wade Bushman at the University of Wisconsin-Madison. In 2014, she was awarded an NIH K Career Development Award from the NIDDK in Urology. She joined the faculty at the University of Washington in 2016. Her group develops new microscale culture and analysis methods to study cell-cell, cell-extracellular matrix, and host-microbe interactions, with a focus on inflammation in urologic diseases and asthma. Your recent Emerging Investigator Series paper focuses on upgrading well plates using microfluidic patterning. How has your research evolved from your first article to this most recent article? My research has changed dramatically since my first article, which focused on chemical synthesis in droplet-based microfluidics. The common thread in both articles is manipulation of fluids on the microscale, but almost everything else is different! While my graduate work focused on chemical applications of microfluidics in conventional closed microfluidic channels, I now work on methods for studying cell signaling in biological systems using primarily open microfluidic channels. For example in this most recent article, the “walls” of the “channel” are comprised of the floor of the well plate, a plastic insert, and two free air-liquid interfaces. What aspect of your work are you most excited about at the moment? I am excited about our group’s fundamental work advancing fluid manipulation in open microfluidics using capillary flow. On the applications side, I am excited to be exploring signaling in ever-more complex cellular systems, including “multikingdom” systems where we study the chemical signals exchanged between host and microbe. I am also happy to work with a fantastic group of students who are taking our group in new directions both biologically and technologically. In your opinion, what is the biggest advantage of the presented patterning device over the current systems? Our method enables biologists to easily “upgrade” any existing assay developed in conventional well plates to a co- or multiculture assay. Well plates are the most common cultureware used for cell-based assays, and our device is a simple plastic insert that fits within the well and enables the user to pipette hydrogels (such as collagen, Matrigel, or synthetic gels) to make biocompatible partitions that enable segregated cell culture and maintain soluble factor signaling through the gel wall. Our device enables biologists to use a familiar off-the-shelf platform (well plates) and culture cells on surfaces that have been optimized by decades of industry experience with tissue culture treated surfaces. Since our device uses “open microfluidics,” it does not require bonding of multiple layers and can be fabricated in a single step via injection molding to scale up production. What do you find most challenging about your research? In which upcoming conferences or events may our readers meet you? I regularly attend microTAS and the Gordon Research Conference on Microfluidics. I also plan to attend the IEEE EMBS Micro and Nanoengineering in Medicine Conference and biological conferences related to our group’s focus areas (microbiome, urologic research, etc.). I try to spend spare time outdoors and enjoy sailing, open water swimming, and climbing. I also like to travel – both to explore different cultures and also wilderness such as the Yukon Territory, Patagonia, and national forest land nearby in Washington. Which profession would you choose if you were not a scientist? I would enjoy having a leadership role in a company or organization. I like brainstorming ideas to develop a vision for large projects and working in teams toward a common goal – be it a product, a discovery, or a process. I decided to be a scientist because the scientific method provides an opportunity to rigorously explore questions, but there are many complex problems outside of science that require exciting new strategies and the cohesive effort of many minds to solve. Can you share one piece of career-related advice or wisdom with other early career scientists? One strategy that has been helpful for me is to be persistent in looking for opportunities to support projects that I care about. As an undergraduate researcher, I designed my own project that required augmenting our department’s gas chromatograph. I was able to secure the funds by talking with different offices on campus (dean’s office initiatives, student project grants, etc. ); I was turned down many times but even those experiences helped me to refine my explanation of the project to have a more compelling conversation with the next person I approached. As an undergraduate summer intern working for Merck, my department did not have funds to send me to a conference to present my work, so I asked the human resources department to fund my trip as a way to promote the intern program as well as present my science; they agreed. In graduate school, I set up an international collaboration in order to develop the expertise required to pursue a multidisciplinary project that I had designed. So for early career scientists, I think it is key to remember that there are many opportunities (even if they are not always obvious at first), and facing road blocks or being turned down several times doesn’t preclude a successful outcome. The primary purpose of the conference is to foster interactions between biologists and medical researchers; chemists, physicists and engineers to enhance and strengthen the potential of microtechnologies in revolutionizing the fields of medicine and biological sciences through the development of new research tools and technologies. The conference is set to have a great talks, with Keynote lectures from Seok “Sid” Chung, Korea University; Jianping Fu, University of Michigan; Amy Herr, University of California, Berkeley; Henry Hess, Columbia University; Marianna Kruithof-de Julio, University of Bern; and Milica Radisic, University of Toronto. The human body consists of tens of trillions cells, all of which theoretically should have the same genome. Depending on genetic and environmental factors, some of these cells experience point mutations. Although most of those mutations are cleaned up by DNA repair enzymes, about 0.01% of them stay. A low percentage of the persistent mutations turn out to be ‘cancer’ while others stay recessive. Several genes, including the ones responsible for cell growth cycle, cause the persistent mutations. Uncontrolled growth of cells leads to formation of tumor, which is now prone to experience more mutations due to continuous proliferation. These mutations create heterogeneity among the cell population of a tumor, and eventually some cells leave their original tumor and start a new one in another organ of the body. When a cell leaves its parent tumor, it starts circulating in blood vessels before settling in. Those cells are called circulating tumor cells (CTCs), and around 1-10 CTC can be found in 1 mL of blood (which contains about 1 billion red blood cells, and 1 million white blood cells). Capturing ultra-rare CTCs has enormous implications in early cancer diagnosis. Often times, analysis of at least 10 mL of blood is necessary to capture sufficient CTCs to confirm their presence. The available technology can achieve CTC capturing in about 10 hours leading to the loss of target cells and decay of detection biomarkers. Figure 1. Overview of the CaTCh FISH platform. 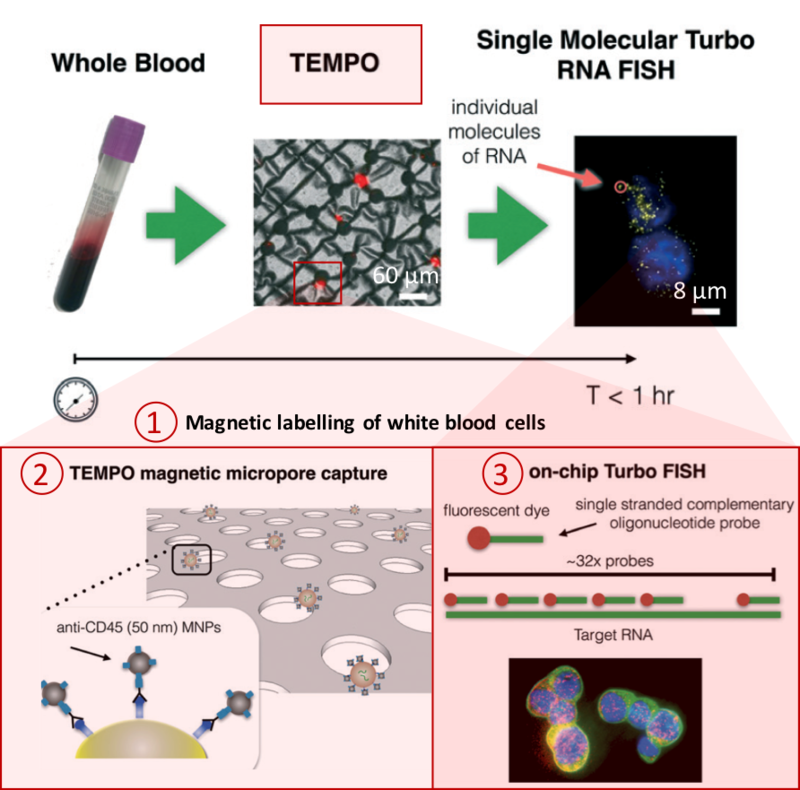 Whole blood sample is processed in TEMPO step, where magnetic nano particle based cell separation is followed by single-cell RNA analysis (modified from Ko et al., 2017). Processing a whole blood sample using CaTCh FISH involves three steps (Figure 1). First, white blood cells are labelled with magnetic nanoparticles. Second, whole blood is passed through a magnetic micropore filter to selectively trap magnetically labelled cells. “Our magnetic micropore device rapidly and precisely removes all of the cells that we know are not CTCs”, says David. The operating principle of magnetic micropore filter is based on strong and highly localized microscale field gradients formed at the edge of micropores to enable application of high flow rates. Third, single cell RNA analysis is performed on isolated cells using rapid in-situ hybridization strategy so that CTCs can be identified within the isolated cell population. In this way, targeted CTCs can be isolated from the rest of the cell population regardless of their physical and molecular properties. Analysis of a 10 mL blood sample takes less than an hour. As a key novelty, the researchers maintained high-throughput processing and high sensitivity at the same time by integrating the FISH technique (hybridization of 20-50 fluorescently-labelled oligonucleotide probes to the target RNA, and subsequent fluorescence-signal based detection to enhance signal-to-noise ratio) in a microfluidic chip. CaTCh FISH has also been tested in patients with pancreatic cancer and detected CTCs in the real patient samples. “The CaTCH FISH technology can be easily modified to measure other rare cells, for the diagnosis of other cancers or for stem cell research for example, by modifying the RNA FISH probes”, says David. He considers converting the platform to a high-precision hospital-based diagnostic tool and he collaborates with a company in the Bay area for this process. The CaTCh FISH device is poised to have a big impact on the way cancer is diagnosed. You are currently browsing the Lab on a Chip Blog blog archives for December, 2017.